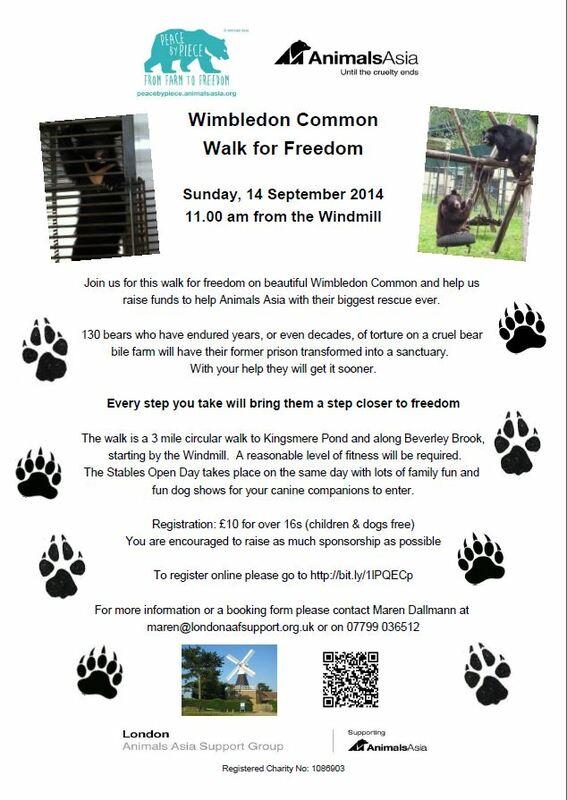 After a 2 year break we are reviving the Wimbledon Common Walk for Freedom and this year it will coincide with the Stables Open Day, with lots of family fun and fun dog shows. Come and join us for our walk and then stay on to enjoy a day on beautiful Wimbledon Common; your canine companions could even enter one or more of the dog shows. Our walk will raise funds to help us adopt one of 130 bears on a bear farm in Nanning, Southern China, which is being converted into a sanctuary by Animals Asia. The funds we raise for our bear will directly help with the conversion as this will provide her with all she needs for the first two years of being looked after by Animals Asia. You can book your place online or contact us for a booking form or further information using the form below. Please note that the online booking incurs a small booking fee. We would love you to raise as much sponsorship as possible too. You can download a sponsorship form here or use the form below to request one. If you haven’t met little Smudge yet, the last moon bear cub to be born in captivity on the Nanning farm, have a look at the little video here. Luckily she will never know the tortures of bile extraction. This entry was posted on Wednesday, July 16th, 2014 at 1:46 pm	and tagged with Animals Asia, Moon bear rescue, moon bears, Peace by Piece, Walk for Freedom, Wimbledon Common and posted in Animals Asia, Animals Asia UK, Fundraising, London events. You can follow any responses to this entry through the RSS 2.0 feed.